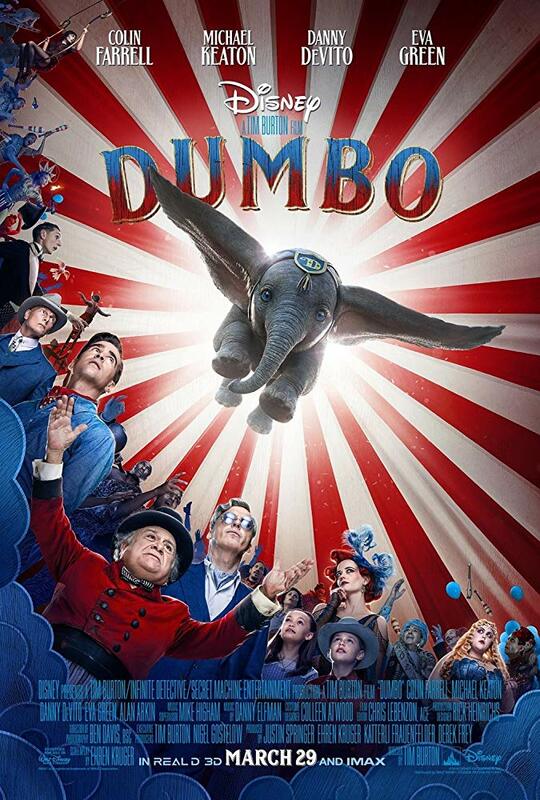 Yet another of Disney's many live action remakes arrives in the form of Dumbo, though this time round we have a finished product that differs in many ways from its animated counterpart; consequently, one might want to consider it a new story partially inspired by Disney's 1940 classic. In Tim Burton's newest production, you won't find any mice specialising in one to one coaching, storks delivering newborn baby elephants, and certainly not any racially offensive singing crows smoking enormous cigars. Instead, we have story of a financially struggling circus and a family living and working within it enduring their own hard times, all taking place following the first World War. Of course, our eponymous elephant is indeed in here somewhere. Colin Farrell stars as Holt Farrier, an amputated war veteran and widower. The travelling circus he works within and returns to following army service is also home to his children Milly (Nico Parker) and Joe (Finley Hobbins); the circus itself finds itself in a state of financial decline, but following the birth of a newborn elephant with strangely oversized ears, takes an interesting turn that nobody involved could have anticipated. The cast also features the likes of Danny DeVito as circus owner Max Medici, Michael Keaton as the greedy Vandevere, owner of an amusement park who eventually strikes his own business deal with Medici, and Eva Green as Colette Marchant, a charming and experienced trapeze artist employed by Vandevere; this entire cast performs brilliantly, primarily Keaton in his sly yet funny villainous role, though on the other hand it is a shame DeVito is somewhat underused given his inevitable comedic charm. The effects used to bring Dumbo himself to life are as refined as one would expect from a modern blockbuster, particularly one in the hands of Disney, and he finds himself blended seamlessly into the live action world around him. The actors themselves of course deserve praise when it comes to their interactions with Dumbo, bringing forth some heartfelt and similarly funny scenes, well executed considering the character wasn't there to start with, as well as praise toward their performances within the film's several entertaining set pieces. 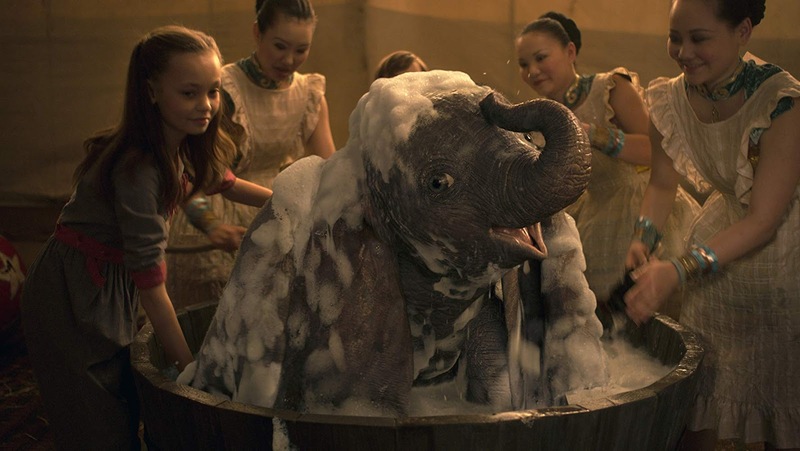 Dumbo does find itself somewhat flawed when it comes to its storyline, which of course, as previously said, was stirred up dramatically from the animated original to be more fitting for a live action premise and of course to justify a longer run time. But even with this new material, the near two hour length is still a bit much, making the film somewhat repetitive as it goes on and occasionally quite boring as we near the middle. Dumbo as a character is fairly entertaining to watch, certainly funny and the centre of some touching moments once again, but in general isn't overall memorable and regrettably has moments of being slightly annoying; when it comes to repetitive moments, Dumbo's fear of flying is definitely something to mention. This is all in all an entertaining film for the most part, appealing for older and younger audiences, and of course boasting some superb visuals, but also it's also a film that needed to focus a bit more on streamlining its narrative into something a bit more focused and much less samey.